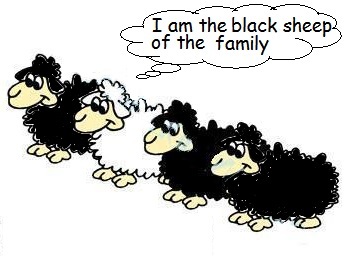 Image Posted on May 2, 2013 by skywanderer Tagged activismblack sheep	Comments5 Comments on All the black sheep of the world unite! All the black sheep of the world unite! This entry was posted in activism, black sheep and tagged activism, black sheep. Bookmark the permalink. For the sake of covering the fullness of the topic: no matter if we define white as black, white is still white and black is still black. That’s the rule of our existence: it has objective rules. Is This Not The Craziest Job Ever?! Further to news: why do I hate watching/listening to them?